Avoid non-sterile medical or cosmetic equipment Learn actions you can take to stay healthy and safe on your trip. Vaccines cannot protect you from many diseases in Bulgaria, so your behaviors are important. Eat and drink safely. Bulgarian Travel Agent has some advises for you that are general advises and are valid worldwide, just use then as precaution for your safety. Talk with your doctor about taking prescription or over-the-counter drugs with you on your trip in case you get sick. Sick traveler is not a happy traveler and BTA is just to remind you of our human nature. 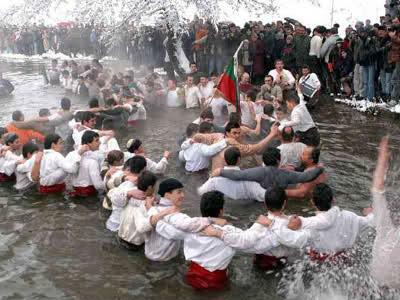 Bulgarian Travel Agent is dedicated to increase visitors safety.Following our advice would keep you almost as healthy as these guys bellow, dancing in the ice cold water of Tundga river keeping an old tradition alive. Traditional horo in the ice cold Tundga river for Christmas.